Q&A with with Daniel Young of Young & Foodish, Daniel asks the questions and I get carried away with the answers. How did Bertha’s get started? Bertha’s what we christened our first oven, a Sheffield Steel, brick lined Garden Oven where we began the transition from home bakers to pizzaiolos many years ago, you’ll still see her outline in our logo, a nod to where it all began. Our friends were gracious and put up with the cindered, failed attempts in the early days. We experimented with every recipe we could find and slowly, honing our skills along the way, started to improve. Our only goal was to get better each bake, and it was clear we were moving in the right direction, as our friends started inviting themselves over, as we began to converge on our characteristic long ferment sourdough base. We love the food culture in Naples, that pizza is food for the masses and rich and poor sit side by side in their favourite pizzeria. Our style takes more of a lead from what’s going on the other side of the Atlantic though and we’re lucky enough to have met and worked with some of our pizza heroes at Pizzicletta, Bianco's, Paulie Gee’s and Robertas to name just a few. They don’t get too hung up on the ’Italian classics’ and instead focus on showcasing the best of what’s growing locally exactly as we aim to do in the South West. Why was it important for you to have a wood oven vs a gas or electric one? I used to be a wood puritan, that was the only option. My heart said ‘wood’ but my background as an engineer said 'prove it'. So that’s what I did, armed with four trays of dough at three different hydrations or water contents and an infrared thermometer I went to an oven builder who had two identical ovens side by side, one fuelled with wood and one gas. Fifty pizzas later and I was more open minded when it comes to fuel source. Given the choice between wood, gas or thermal mass, it’s the weight, design and quality of the oven which wins hands down every time. There’s good reason for this, when you’re working an oven hard you’ll drop the temperature of the deck, and conversely, with too much fuel in a ‘light’ oven you can easily overheat it - that thermal mass acts as a buffer, inertia to those fluctuations in temperature and more consistency in your crust. That’s before I’ve even touched on the size and shape of the mouth of the oven (smaller’s better for holding the heat but harder to work), the position of the heat source (don’t put it at the back and have all the heat billow out the front even if it is easier to turn the pizzas), the shape of the dome, type of masonry used and a myriad of other factors I could bore you to death with. For what it’s worth in our restaurant we’re planning to install an oven from Stefano Ferrara, a third generation oven builder from Naples, a true artisan who builds all the ovens from bricks by hand rather than from pre-fabricated slabs; we’ll get the hybrid version, fuelled with wood or gas, to satisfy my heart and head. How did you go about acquiring and installing your oven on your yellow rover? Bertha’s ex Darlington Borough Council Highway maintenance, now all ovens we own or vehicles carrying them end up being called Bertha. We run our oven hot, 500C plus, getting insurance for this in the back of your car above the fuel tank isn’t straight forward so we outsourced the installation to the Dragon Oven guys who know what they’re doing. The oven’s built within the vehicle, each piece just fitting through the rear door. There’s a steel subframe which is bolted to the chassis, a two piece floor, three piece dome and lots of insulation. You have to cure in the oven over a week, slowly building larger and larger fires to dry it out gradually and stop it cracking. It loses 100kg of water through this process which without the doors open results in a very soggy dashboard. Which of your pizzas are you most proud of? We love our margherita, there’s a reason it’s a classic, the simplicity means the flavour of the dough comes through and the quality of the ingredients can shine. Having said that we’re more known for our less traditional toppings and if we can incorporate some foraged produce even better. Creamed nettles, cheddar and chilli is worth the stings and our Kimcheese, with house kimchi and Devon Blue tends to raise eyebrows and delight in equal measure, the spice, crunch and acidity of the kimchi offsetting the rich, creamy blue cheese. 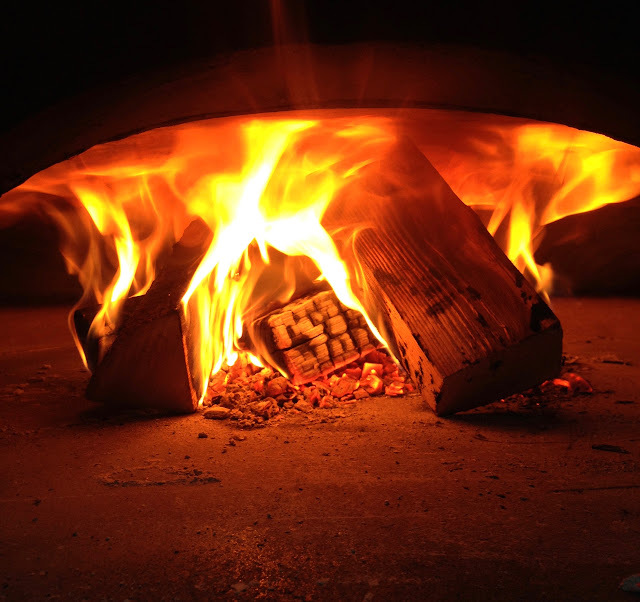 What differences do a wood oven make in the finished pizza? Far less than you’d think and I’d challenge anyone to tell the difference in a blind taste test. It adds more to the atmosphere, the romanticism, with the flicker of the flames lapping the dome. I used to think you’d only get the distinctive flecks of leopard charring with a wood oven but experience tells me it’s more linked to the dough and heat stored in the masonry. I’ve a friend who runs a renowned pizzeria in Canada who’s just sent me a video of a beautiful pizza made in a gas oven without any flame at all, the heat stored in the bricks baking the pizza to perfection. Can you truly taste the wood or smoke in the flavour of the crust? And if you can’t, why use wood then? I don’t think so, my palate couldn’t pick it up in a side by side comparison. When we want to push smoked notes we’ll select smoked salts, cheeses or charcuterie, the flavour of which will dominate any smoke imparted through cooking. In fact, next time you’re staring into a Neapolitan oven take a look at the couple of inches from the deck of the oven up the sides of the walls, you’ll notice there’s never any soot on this band, even on cooler ovens as the draft from the chimney doesn’t let the smoke drop to the base - another reason to think any affect would be minimal. Using wood’s all about the romanticism, the challenge and excuse to play with fire. What is the greatest challenge for you associated with using wood? Working with wood’s a real challenge, it’s a natural product, prone to variation and the first task is to find a variety and source which suits your location and style you’re aiming for. I worked at a pizzeria in Flagstaff above 2000m where the lower oxygen content in the air meant their wood had to be incredibly dry, they ended up using desert dried Arizona pecan. Once you’ve got the wood there’s an art to maintaining the fire at just the right temperature, when you add a log the temperature of the oven will drop, particularly with lighter ovens so there’s no use throwing in a piece just before you need it. There are plenty of tricks of the trade, you can ‘stage’ logs, preheating them in other parts of the oven and use a variety of sizes or sawdust to get a more reactive boost of heat but it takes years to get properly acquainted with your oven and how to get the best out of it, good job we’re in this for the long haul.